Jennifer Wan, M.D., CMHS CardioThoracic Surgeon, will present a lecture on “Minimally Invasive Thoracic Surgery for Lungs and Esophagus”. She will discuss how to 1) Describe the advantages and technical considerations associated with the minimally invasive strategies in the management of basic and complex thoracic disorders, and 2) Discuss controversial issues, emerging techniques, and future directions in minimally invasive thoracic surgery. The conference will take place on Tuesday, April 16, 2019, at noon, in Nichols Auditorium. Lunch will be provided and Category 1 & 1-A CME will be available. If you would like to view this lecture online, please contact the CME Coordinator, Christeva Vazquez cvazquez1@cmhshealth.org or 805-948-5638. The CME Committee wants to thank you for being a part of the Continuing Medical Education program at Community Memorial Health System. In an effort to improve upon the program and bring more CME opportunities to CMHS, we ask that you please take the time to complete the survey at the link below. Your input is invaluable and instrumental in helping the CME program grow. We ask that you please complete the survey by April 24th. 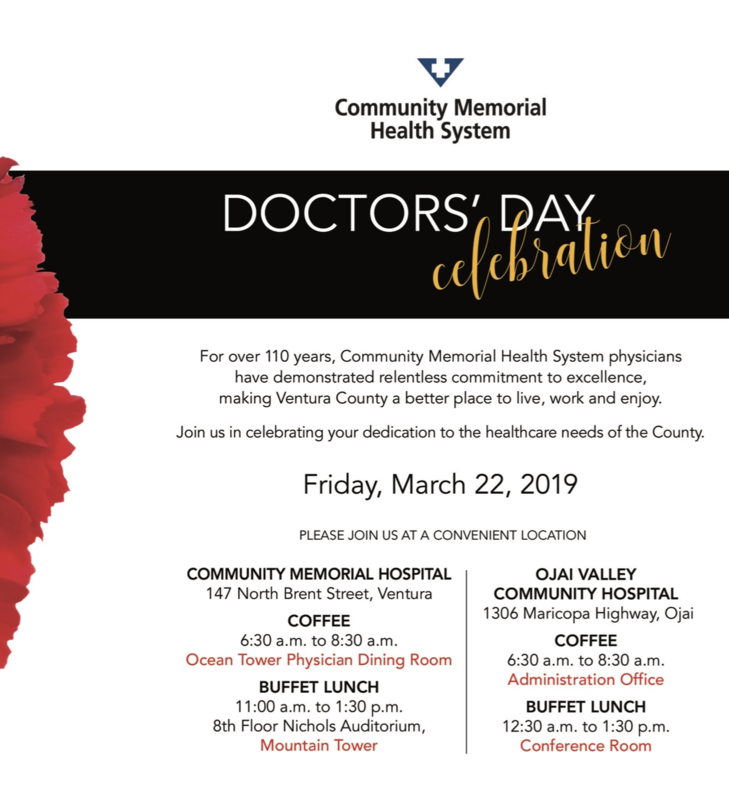 If you have any questions whatsoever, please do not hesitate to contact Christeva Vazquez at cvazquez1@cmhshealth.org or at 805-948-5638. Thank you again for your support, and we hope to see you at future conferences! How do you know when your patients have dysphagia? Do you wonder what diet they currently receive, if their diet texture has been changed, or if they need thickened liquids? How much time do you spend finding this information and would it help if the current diet was indicated on your patient’s wristband at all times? You may have noticed your stroke patients wearing green wristbands (placed by nursing in the ED) indicating the Pass/Fail of a nursing dysphagia screen. Patient safety is our priority and a wristband for all patients with dysphagia would help ensure awareness with aspiration prevention. The speech pathology department is about to introduce another dysphagia green wristband to encompass all patients with dysphagia which will include their exact diet. Each patient’s wristband will be updated immediately to reflect any changes made to the diet texture or liquid viscosity at all times. The SLP department will be in-servicing all staff prior to the launch of this new process. The goal is to improve the continuity of care throughout our patients’ hospitalization. Immediate visibility of diet recommendations is valuable for our patients’ nurses, family members, dining service staff, doctors, therapists, dieticians, and all who provide care. What if your patient goes to the therapy gym and requests a glass of water? How does each therapist know which liquid level the patient currently needs? The wristband will notify therapists daily and ensure that the correct liquid level is provided. This wristband will remain on the patients’ wrists throughout the entire hospitalization. It will also serve to inform future caregivers at the next level of care. We hope this new wristband helps to reduce time spent searching for correct diets as well as increase safety and continuity of care at CMHS! ***Attention Mobile Heartbeat Android Users*** Please be advised, Android has made a change to their push notifications. If you are an Android user, please visit Android MH Upgrade to update your MH app. Android users who have not updated their MH app will no longer receive any push notifications from MH. If you require assistance, please call the CMHS Helpdesk 805-948-5090. We currently are unable to obtain our formulary Potassium Bicarb/Citric Acid effervescent tablets. The manufacturer is not providing an expected availability date. We have oral potassium chloride available in tablets and powder packets for those unable to take tablets as an alternative. PACS Will Be Down For Upgrade And Maintenance on Wednesday, April 24th, at 3 a.m. We will continue sending exams to ATR (our nighttime radiology service) for the night. We estimate this downtime will be for 2 hours. ATR will be faxing the reports since the system will be down. Ronald Pollack, M.D., Psychiatrist, will present a lecture on “PTSD”. 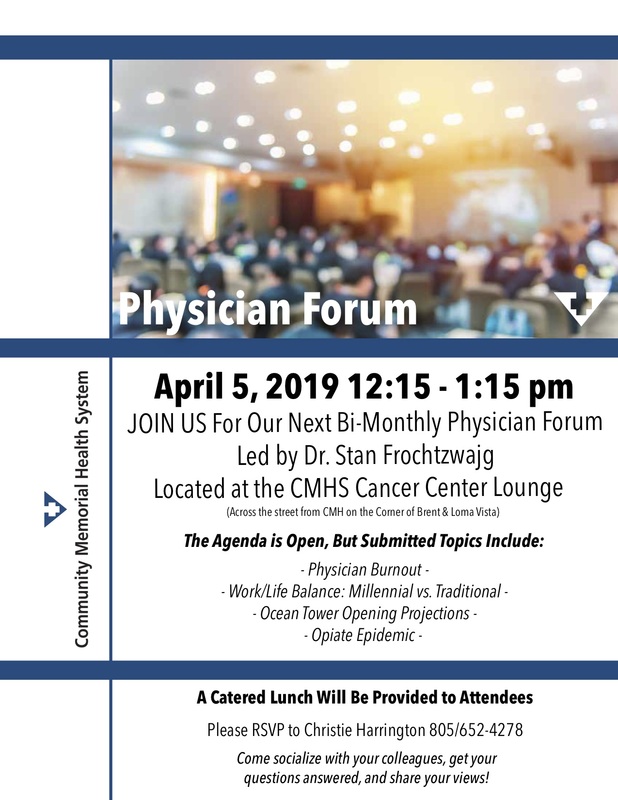 He will discuss how to 1) Identify characteristics associated with increased or decreased risk of PTSD, 2) Compare symptoms that distinguish PTSD with other psychiatric conditions, and 3) Propose evidence-based treatment strategies for PTSD. The conference will take place on Tuesday, April 9, 2019, at noon, in Nichols Auditorium. Lunch will be provided and Category 1 & 1-A CME will be available. If you would like to view this lecture online, please contact the CME Coordinator, Christeva Vazquez. 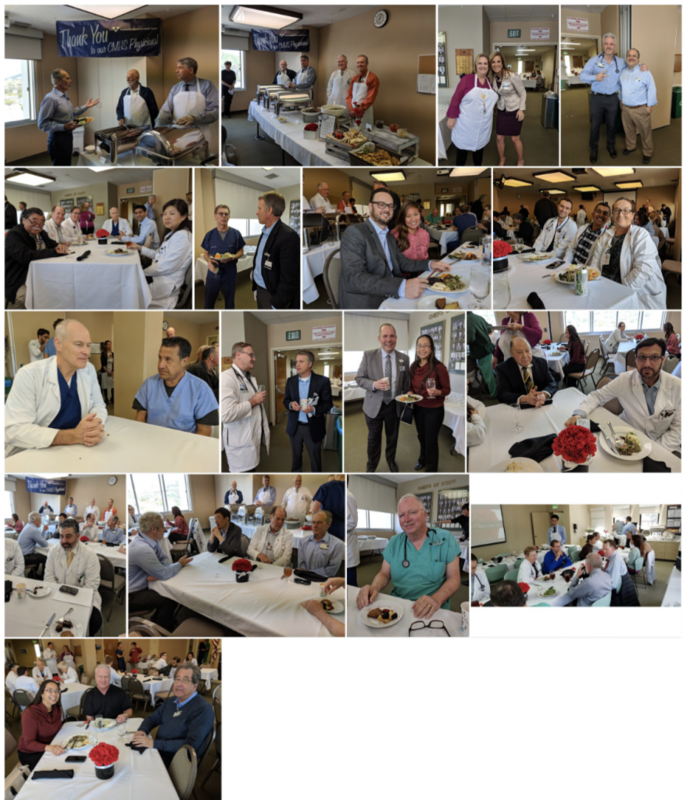 Last Friday’s Physician Forum provided a learning experience for the physicians that attended the luncheon. Dr. Kwon provided us with insight on the extensive newer regulatory and compliance requirements for the expanded (and sometimes complicated) Path reports we now receive. A few physicians in the group bemoaned the comparable note “bloat” they experience in EHR generated notes, provoked by the same compliance issues (see related EHR article below). We watched and discussed Dr. Damania’s six-minute minute video on “Moral Injury”. We ended the one-hour meeting with a review of some of the new clinical service lines having started and upcoming soon at CMHS. Our next meeting is in two months. I encourage you to attend, learn from your colleagues and ask any questions. My Opinion: Despite being a very well written article, a few important perspectives are neglected. EHR’s are indispensable in our “new” healthcare delivery system. Before EHR’s, when a physician managed the outpatient and inpatient care of the patient, assuring continuous, accountable and personalized care, we did not experience as acutely the current issues of fragmented care with the concerns for proper patient handoff, follow up, and successful referrals. 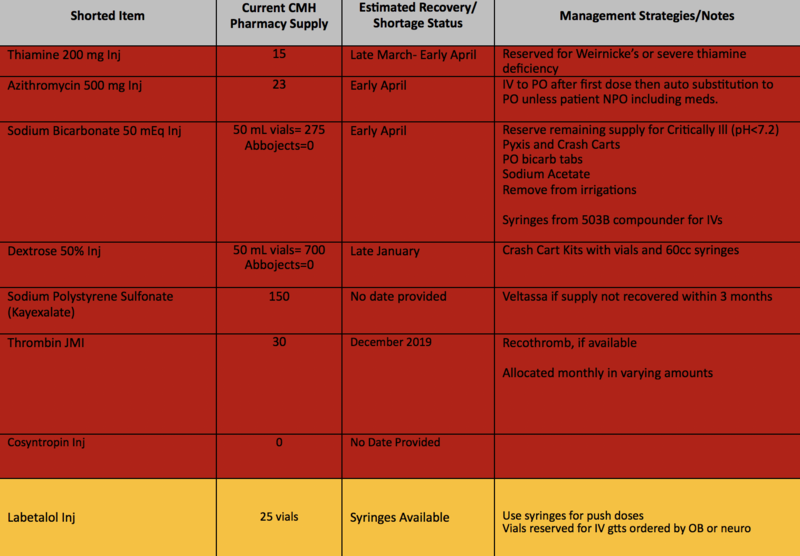 EHR’s provide a “patch” for that fragmentation that would be impossible to achieve with paper. My memory has not faded so much that I don’t remember not being able to read at least 50% of the handwritten notes of my colleagues or even some of my own notes. The dangers of illegible notes and even greater danger of illegible orders are completely neglected by this article. We’d be interested in your perspectives and can publish your opinions if you are willing to allow me to do so. Are you a family physician who graduated from medical school in 2008 or later? Talk to CAFP about family medicine, women’s health, and your work! CAFP is working with the Person-Centered Reproductive Health Program at UCSF, conducting 60-minute interviews with early-career family medicine physicians on how women’s health care, including medication abortion, fits into family medicine. Interview participants will receive a $100 gift card for their time. Contact Sarah Wulf, sarah.wulf@ucsf.edu or 415-206-8699 to screen for eligibility and schedule an interview. 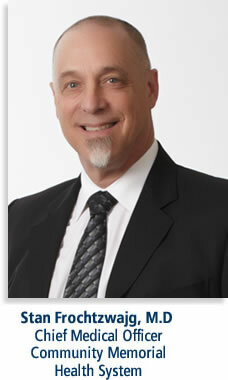 Michael Trauner, M.D., will present a lecture on “Mohs Micrographic Surgery”. He will discuss how to; 1) identify important Mohs practice efficiencies including the use of specialized instrumentation, and 2) Summarize technical skill and/or precision necessary in the execution of the Mohs technique. The conference will take place on Tuesday, April 2, 2019, at noon, in Nichols Auditorium. Lunch will be provided and Category 1 & 1-A CME will be available. If you would like to view this lecture online, please contact the CME Coordinator, Christeva Vazquez. There are new developments in the CMH Cardiothoracic Surgery realm to share with the medical community. Dr. Jennifer Wan joined our team January 1st, after six years at the Kaiser Thoracic Surgery Referral Center for the California Central Valley, and fresh out of a five-month Cardiac Surgery “Super – Fellowship” at the Mayo Clinic. 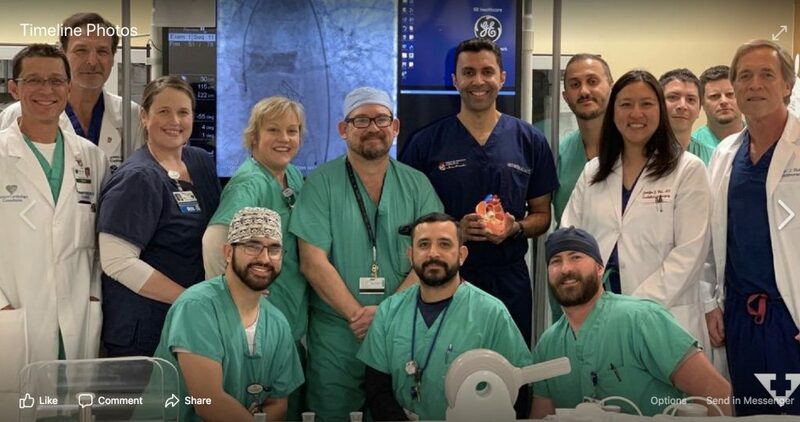 She brings fresh enthusiasm and added scope to our program, especially in the areas of minimally invasive thoracic oncology surgery and foregut procedures, and has worked closely with Dr. Omid Fatemi in the development and launch of the successful new Trans-Aortic Valve Replacement (TAVR) program now established at CMH. She has been very pleased with the friendly reception she has received and the exceptional practice environment she has encountered here. As many have heard, Dr. Dominic Tedesco has accepted and moved into a practice opportunity with Dr. Peter Baay ( a fellow surgery resident with me many years ago and longtime friend ) at Cottage Hospital starting this month. Needless to say, Dr. Tedesco’s impressive 30-year tenure at CMH has been an instrumental part of what has allowed the Cardiac Surgery Program to grow and thrive, and he and I have enjoyed a long successful partnership virtually unheard of in the Cardiac Surgery world. Dr. Tedesco and Dr. Baay both have and maintain medical staff privileges at CMH and we all look forward to continued mutual assistance and cross-coverage to support and advance the established history of cardiac surgery excellence at both hospitals. The only constant is change, but what has not changed is the long-standing commitment of CMH administration, staff, and physicians that has allowed the Cardiac and Thoracic programs here to excel and thrive, and will continue as we advance forward in our new Community Memorial Hospital. In an effort to provide the best quality results, beginning April 3rd, 2019, the CMHS laboratory will now offer the 5th generation HIV assay replacing the current methodology. The New CMHS Medical Library Temporary location is open! The new location is Mountain Tower, Basement (old cafeteria). The Library has three networked computers, a networked printer and dedicated study space. All content can be accessed via the library web page (internal and external). Let me know how the library can assist with any informational needs. Scott Goodfriend, M.D. & Stacey McCarthy, will present a lecture on Clinical Document Review. They will discuss; 1) How complete and accurate documentation assists with quality, compliance and determining the medical necessity of admissions; and 2) How to describe common diagnostic terms needed for accurate coding. 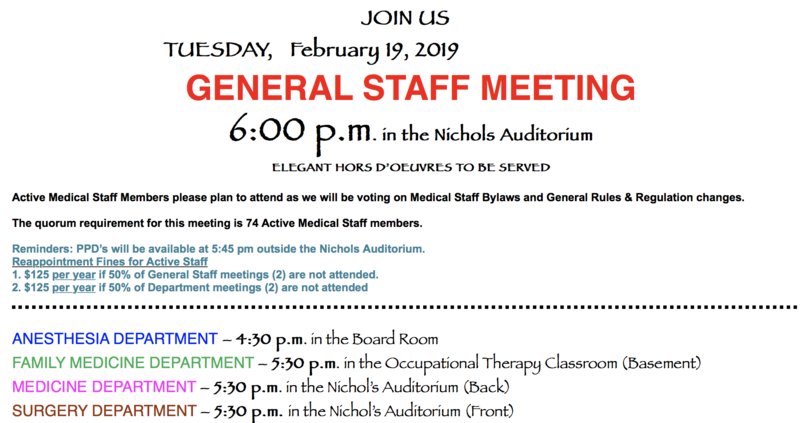 The conference will take place on Tuesday, March 26, 2019, at noon, in Nichols Auditorium. Lunch will be provided and Category 1 & 1-A CME will be available. Stacey McCarthy, CDI Consultant from Navigant, will be our guest for this week. She will be giving a series of enlightening talks and discussions on the value, importance, and insights into how clinical documentation can be enhanced for patient safety and quality of care. 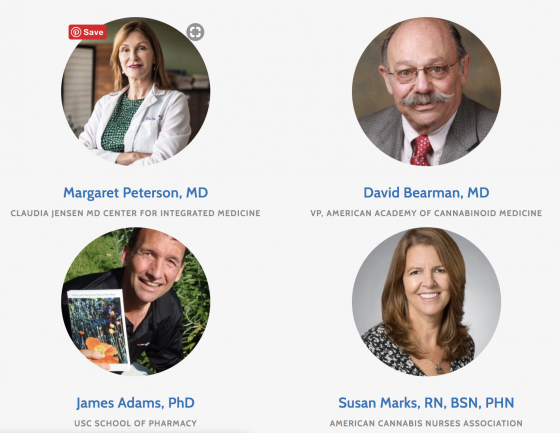 She will speak at the Tuesday Noon conference and at Resident and Hospitalist meetings throughout the week, leaving plenty of time for one on one meetings. Please call Dr. Scott Goodfriend at (805) 701-3514 for questions or for arranging a time to meet with Stacey McCarthy to answer any questions you may have. The goal is really to “capture reality” meaning clarifying what is really happening with the patient and what are we really thinking about in our plan for capturing the risks and complexities of our patient’s care (“Think in Ink”). 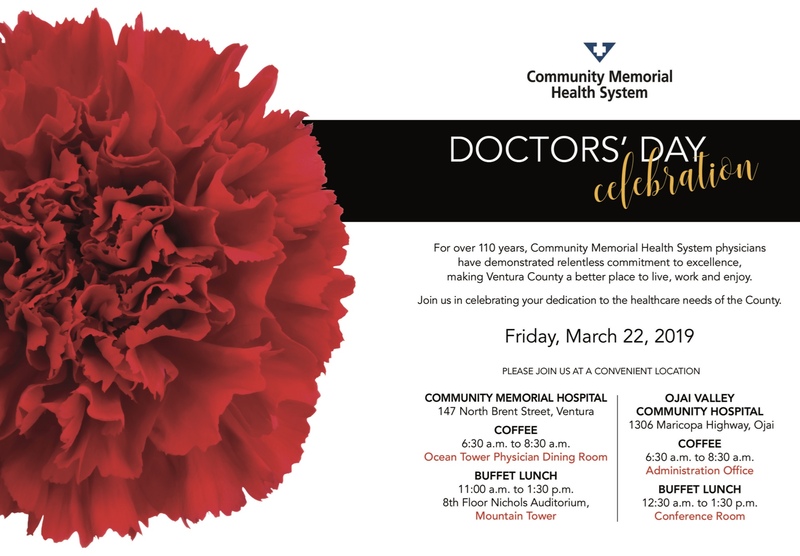 Thank you to Tracey Shoop, the Doctors’ Day Committee and Administration for supporting the wonderfully successful celebration for our hardworking and dedicated physicians of CMHS. If a response is expected and not received (including communication to off duty users) escalate communication to a telephone call following the proper chain of command. The Inpatient Palliative Care Team has moved their offices to room 6241 in the Ocean Tower. This was the room originally designated for the discharge lounge. 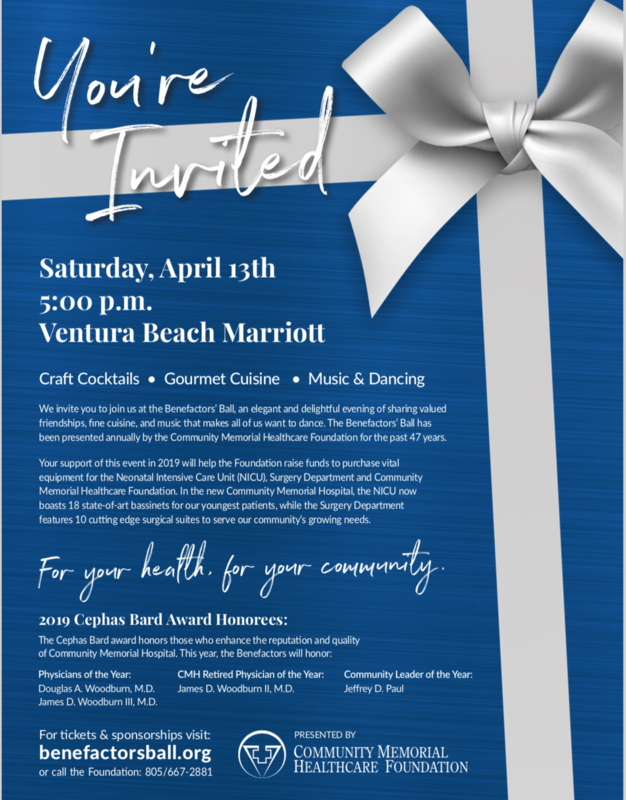 Time is running short to purchase tickets to attend the Ball to show support for our Medical Staff Honorees who have been honored by the Foundation and Medical Staff Leadership. If you’re not able to attend, you can purchase tickets or a table for your staff or others who you would like to treat to this celebration.